Quail breeding is both a hobby and a business that requires skillful care. The act of raising quail starts even before the time their eggs have hatched, just as the earliest signs of quail life manifest themselves. Prepare to devote 21 days of your time to an incubation period which creates the environment for quail eggs to grow and develop into quail chicks. Conditions in an egg incubator: Without the mother quail to provide a natural moist and warm environment for eggs to successfully hatch, incubating quail can be simulated by many commercial and homemade incubators and hatchers. More affordable ones are made of Styrofoam, while better, more efficient ones are made of wood. Hatching quail requires maintaining temperature and humidity within a clean and stable environment. Forced-air incubators for larger, commercial projects have internal circulating fans to maintain temperature at 99.5 degrees Fahrenheit, while the more common still-air incubators are smaller and equipped with air vents to keep temperature ideally at 102 degrees Fahrenheit. Moisture inside an incubator should be kept at 60% humidity or at around 85 degrees Fahrenheit. Quail eggs are placed flat on an incubator with the more rounded end slightly elevated. This protects the air bubble inside which enlarges along with the temperature and humidity. Temperature readings are taken daily by putting the thermometer bulb close to the rounded ends without touching them or the incubator. Humidity is measured with a hygrometer, and moisture is maintained by refilling a water trough or pie pan with fresh water every day. Some incubators rotate eggs automatically, although most quail owners prefer to rotate their eggs manually at least three times a day. With one side of each egg marked X and the other O, owners gently turn over the eggs an odd-number of time to make sure positions have been shifted. 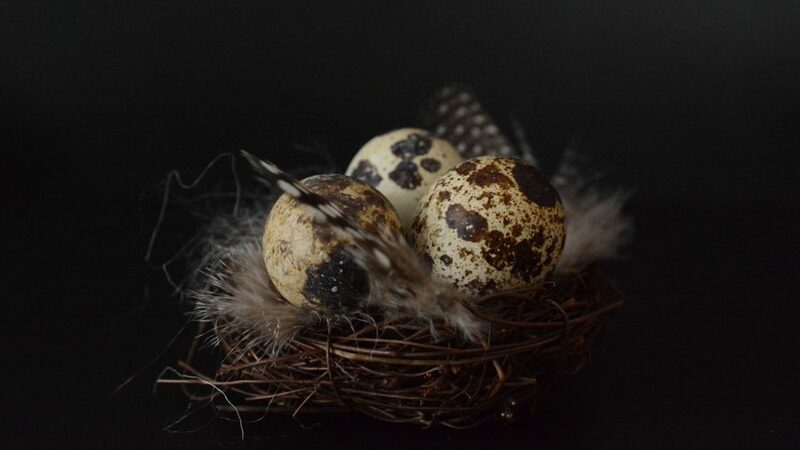 Conditions within the fertile quail egg: Before incubating quail eggs, inspect that all of them are clean and intact. Avoid washing or rubbing them with wet cloth, because this destroys their porous protective coating. Discard all eggs which are odorous and cracked, and retain those with clean, strong shells. To check if each egg has been fertilized and will grow into an embryo, hold it up against a light and spot the cloudy mass of embryo through the shell. As it grows, this embryo will need more oxygen and ventilation along with warmth and moisture. What to expect when incubating quail eggs and hatching quail: Not even under natural, fertile conditions would you expect all quail eggs to hatch. With quail breeding, only around 50 to 75% will hatch given the right care. Hatching quail by overheating causes either premature cracking or early hatching, while under-incubating results in late hatches, both of which lessen survival. Stop rotating the eggs three days before hatching, as the embryos are already in position and will hatch on their own. The chicks will pick through the shell along the air bubble and emerge as living offspring. Don’t rush in taking them out of the incubator since they are still well-nourished. Allow them another 24 to 48 hours before releasing or another six to seven hours before transferring them to a brooder. Feed the baby chicks with chick mash or dry mash food and clean water through water cups which are shallow and laid with marbles at the bottom to prevent the chicks from drowning. Count these as part of raising quail after a successful incubation. Finished reading about how to incubate quail eggs and hatch your quail in your backyard? Read more quail raising articles in our free quail article library!